Lee & Low Books, 2008, 64 pp. This biography tells the story of a young Japanese boy who loved cars and grew up to manufacture cars, motorcycles and airplane propellers. The author begins when Honda was only seven years old and enjoyed watching large boats sail into the harbor, where he saw the first car rumbling through his small town. The car was a Ford Model T, and Honda immediately fell in love, vowing to learn how cars work and to make one himself. Honda was not a good student in school, but he loved to make things with his hands. As a teenager, he moved to Tokyo and found work as a janitor in a car repair shop. For six years, he learned to repair every part on automobiles. He was then ready to open his own shop where he perfected engine parts to sell to Toyota. During World War II, he made propellers for the Japanese Air Force and became quite wealthy. All was lost when Japan was defeated, but Honda soon began manufacturing motorcycles for the poor Japanese people who could not afford cars. While most motorcycle companies were concentrating on building large bikes, Honda found his niche with small motorbikes. When he later made his first cars, they were an instant success. Most everyone in the world now knows his last name and his cars, motorcycles and other equipment. The book is an excellent example of how a very young boy with a dream and determination can work hard and achieve incredible success against all odds. The story offers many opportunities to teach about perseverance as Honda built a large company only to see it destroyed when Japan was decimated because of its involvement in World War II. 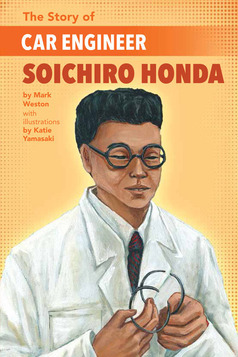 The book accurately portrays Honda as a businessman of the world who recognized that his small motorbikes would sell big even in the United States only fifteen years after the U.S. had defeated his country at war. He literally beat the American motorcycle companies at their own game. The book will interest anyone who enjoys cars and motorcycles, especially those who can identify with Honda working on his bikes and cars, and who often are hard to reach with literature. Katie Yamasaki’s illustrations for the book are clear and authentic. There are very good drawings of Honda with the piston rings he designed for Toyota Motor Company and some of Honda racing cars, riding motorcycles, and yelling at his employees. Mark Weston does an excellent job of depicting ordinary Japanese life during and after WWII, and Katie Yamasaki’s illustrations show the clothing and culture of Japanese people riding motorcycles and working on Honda’s assembly line. The book could be used as an incentive for students to write about their dreams, no matter how fanciful. Few believed Soichiro Honda could rise from janitor to the largest manufacturer of motorcycles in the world and one of the largest manufacturers of cars. Other interesting biographies in this series include The Story of World War II Hero Irena Sandler (2018) by Marcia Vaughn and The Story of Tennis Champion Arthur Ashe (2018) by Crystal Hubbard.